Greg (@sarcasymptote) is responsible for the first known instance of puppies in peril. Chris Lusto formalized it into a theorem. It all started when Bowman Dickson posted The Dead Puppy Theorem and Its Corollaries. 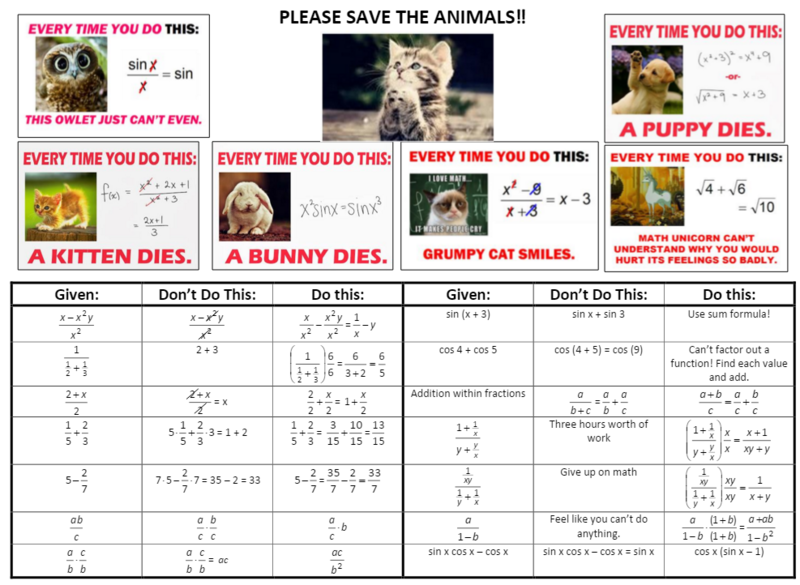 Others joined in on the effort, most notably the additional corollaries developed by Math Curmudgeon I also joined the cause, making a worksheet that covered the do’s and don’ts of exponents. Lisa Winer at eatplaymath took that idea and made an a full-page warning worksheet for her Algebra II students. Lisa posted her worksheet at just the right time as I was about to start one of the more dangerous chapters: Trig Identities and Equations! EEEEK! So I made this and we spent about 15-20 minutes discussing the various problems that come up, why they’re illegal and what to do instead. (file here) We also added more to the back as we needed them (e.g. can’t cancel sin x in 1/sin x + sin x.) I really think it worked as the identities section of their quiz was really quite pretty! Only 4 kittens were harmed in 75 tests! It really made them think about each step and I got a lot of “Mrs Craig, is this hurting an animal?” or “Mrs Craig, is this legal?” questions when we were working on them, whereas before I think they just did magic and didn’t care. What are some constant mistakes that you would want to warn your students about?